NIMBLE is a hierarchical modeling package that uses nearly the same language for model specification as the popular MCMC packages WinBUGS, OpenBUGS and JAGS, while making the modeling language extensible — you can add distributions and functions — and also allowing customization of the algorithms used to estimate the parameters of the model. Recently, we added support for Markov chain Monte Carlo (MCMC) inference for Bayesian nonparametric (BNP) mixture models to NIMBLE. In particular, starting with version 0.6-11, NIMBLE provides functionality for fitting models involving Dirichlet process priors using either the Chinese Restaurant Process (CRP) or a truncated stick-breaking (SB) representation of the Dirichlet process prior. We will illustrate NIMBLE’s BNP capabilities using two examples. In a previous post, we showed how to use nonparametric mixture models with different kernels for density estimation. In this post, we will take a parametric generalized linear mixed model and show how to switch to a nonparametric representation of the random effects that avoids the assumption of normally-distributed random effects. For more detailed information on NIMBLE and Bayesian nonparametrics in NIMBLE, see the NIMBLE User Manual. We will illustrate the use of nonparametric mixture models for modeling random effects distributions in the context of a meta-analysis of the side effects of a formerly very popular drug for diabetes called Avandia. The data we analyze played a role in raising serious questions about the safety of this drug. The question is whether Avandia use increases the risk of myocardial infarction (heart attack). There are 48 studies (the 49th study in the data file is different in some ways and excluded here), each with treatment and control arms. 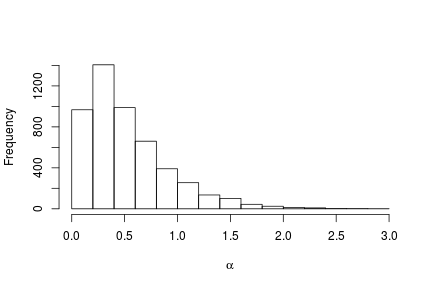 where the random effects, , follow a common normal distribution, , and the and are given reasonably non-informative priors. The parameter quantifies the difference in risk between the control and treatment arms, while the quantify study-specific variation. 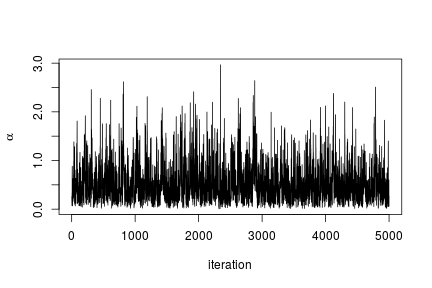 Let’s run a basic MCMC. ## compiling... this may take a minute. Use 'showCompilerOutput = TRUE' to see C++ compiler details. ## runMCMC's handling of nburnin changed in nimble version 0.6-11. Previously, nburnin samples were discarded *post-thinning*. Now nburnin samples are discarded *pre-thinning*. The number of samples returned will be floor((niter-nburnin)/thin). where is a normal-inverse-gamma distribution. gamma[i] ~ dnorm(mu[i], var = tau2[i])  # random effects from mixture dist. # How many mixture components are inferred? The primary inference seems robust to the original parametric assumption. This is probably driven by the fact that there is not much evidence of lack of normality in the random effects distribution (as evidenced by the fact that the posterior distribution of the number of mixture components places a large amount of probability on exactly one component). Please see our User Manual for more details. We’re in the midst of improvements to the existing BNP functionality as well as adding additional Bayesian nonparametric models, such as hierarchical Dirichlet processes and Pitman-Yor processes, so please add yourself to our announcement or user support/discussion Google groups. In this post we illustrate NIMBLE’s BNP capabilities by showing how to use nonparametric mixture models with different kernels for density estimation. In a later post, we will take a parametric generalized linear mixed model and show how to switch to a nonparametric representation of the random effects that avoids the assumption of normally-distributed random effects. The NIMBLE implementation of this model is flexible and allows for mixtures of arbitrary kernels, , which can be either conjugate or non-conjugate to the (also arbitrary) base measure . In the case of conjugate kernel / base measure pairs, NIMBLE is able to detect the presence of the conjugacy and use it to improve the performance of the sampler. To illustrate these capabilities, we consider the estimation of the probability density function of the waiting time between eruptions of the Old Faithful volcano data set available in R.
The observations correspond to the second column of the dataframe, and . where corresponds to a normal-inverse-gamma distribution. This model can be interpreted as providing a Bayesian version of kernel density estimation for using Gaussian kernels and adaptive bandwidths. 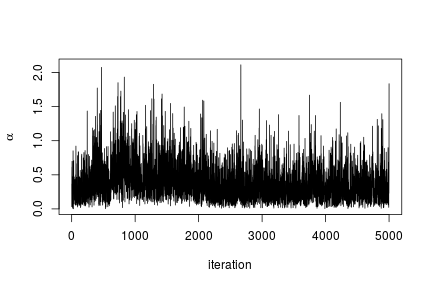 On the original scale of the data, this translates into an adaptive log-Gaussian kernel density estimate. is the number of unique values in the vector , and is the number of times the -th unique value appears in . This specification makes it clear that each observation belongs to any of at most normally distributed clusters, and that the CRP distribution corresponds to the prior distribution on the partition structure. Note that in the model code the length of the parameter vectors muTilde and s2Tilde has been set to . We do this because the current implementation of NIMBLE requires that the length of vector of parameters be set in advance and does not allow for their number to change between iterations. Hence, if we are to ensure that the algorithm always performs as intended we need to work with the worst case scenario, i.e., the case where there are as many components as observations. While this ensures that the algorithm always works as intended, it is also somewhat inefficient, both in terms of memory requirements (when is large a large number of unoccupied components need to be maintained) and in terms of computational burden (a large number of parameters that are not required for posterior inference need to be updated at every iteration). When we use a mixture of gamma distributions below, we will show a computational shortcut that improves the efficiency. Note also that the value of controls the number of components we expect a priori, with larger values of corresponding to a larger number of components occupied by the data. Hence, by assigning a prior to we add flexibility to the model specification. The particular choice of a Gamma prior allows NIMBLE to use a data-augmentation scheme to efficiently sample from the corresponding full conditional distribution. Alternative prior specifications for are possible, in which case the default sampler for this parameter is an adaptive random-walk Metropolis-Hastings algorithm. The following code sets up the data and constants, initializes the parameters, defines the model object, and builds and runs the MCMC algorithm. Because the specification is in terms of a Chinese restaurant process, the default sampler selected by NIMBLE is a collapsed Gibbs sampler (Neal, 2000). 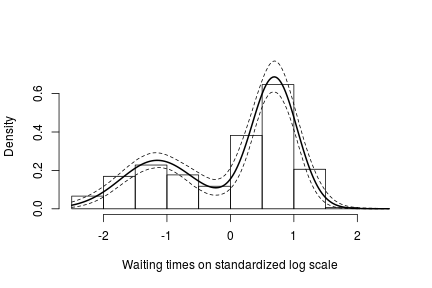 Recall, however, that this is the density estimate for the logarithm of the waiting time. To obtain the density on the original scale we need to apply the appropriate transformation to the kernel. 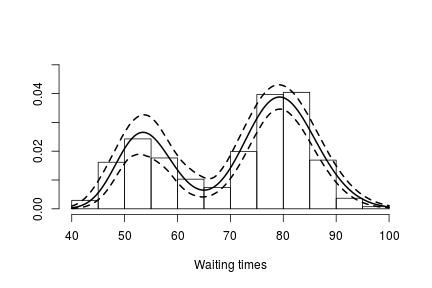 In either case, there is clear evidence that the data has two components for the waiting times. While samples from the posterior distribution of linear functionals of the mixing distribution (such as the predictive distribution above) can be computed directly from the realizations of the collapsed sampler, inference for non-linear functionals of requires that we first generate samples from the mixing distribution. In NIMBLE we can get posterior samples from the random measure , using the getSamplesDPmeasure function. Note that, in order to get posterior samples from , we need to monitor all the random variables involved in its computations, i.e., the membership variable, xi, the cluster parameters, muTilde and s2Tilde, and the concentration parameter, alpha. The following code generates posterior samples from the random measure . The cMCMC object includes the model and posterior samples from the parameters. The getSamplesDPmeasure function estimates a truncation level of , namely truncG. The posterior samples are in a matrix with columns, where is the dimension of the vector of parameters with distribution (in this example ). ## sampleDPmeasure: Approximating the random measure by a finite stick-breaking representation with and error smaller than 1e-10, leads to a truncation level of 33. The following code computes posterior samples of using the posterior samples from the random measure . Note that these samples are computed based on the transformed model and a value larger than 70 corresponds to a value larger than 0.03557236 on the above defined grid. NIMBLE is not restricted to using Gaussian kernels in DPM models. In the case of the Old Faithful data, an alternative to the mixture of Gaussian kernels on the logarithmic scale that we presented in the previous section is a (scale-and-shape) mixture of Gamma distributions on the original scale of the data. Note that in this case the vectors betaTilde and lambdaTilde have length . This is done to reduce the computational and storage burdens associated with the sampling algorithm. You could think about this approach as truncating the process, except that it can be thought of as an *exact* truncation. Indeed, under the CRP representation, using parameter vector(s) with a length that is shorter than the number of observations in the sample will lead to a proper algorithm as long as the number of components instatiated by the sampler is strictly lower than the length of the parameter vector(s) for every iteration of the sampler. The following code sets up the model data and constants, initializes the parameters, defines the model object, and builds and runs the MCMC algorithm for the mixture of Gamma distributions. Note that, when building the MCMC, a warning message about the number of cluster parameters is generated. This is because the lengths of betaTilde and lambdaTilde are smaller than . Also, note that no error message is generated during execution, which indicates that the number of clusters required never exceeded the maximum of 50. ## Warning in samplerFunction(model = model, mvSaved = mvSaved, target = target, : sampler_CRP: The number of cluster parameters is less than the number of potential clusters. The MCMC is not strictly valid if ever it proposes more components than cluster parameters exist; NIMBLE will warn you if this occurs. 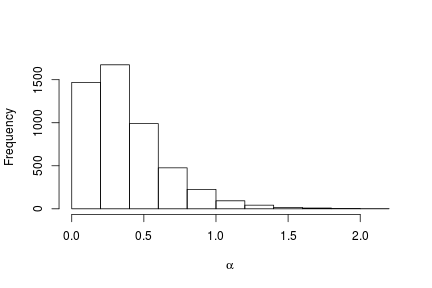 As before, we obtain samples from the posterior distribution of using the getSamplesDPmeasure function. ## sampleDPmeasure: Approximating the random measure by a finite stick-breaking representation with and error smaller than 1e-10, leads to a truncation level of 28. Again, we see that the density of the data is bimodal, and looks very similar to the one we obtained before. An alternative representation of the Dirichlet process mixture uses the stick-breaking representation of the random distribution (Sethuraman, 1994). NIMBLE allows us to specify an approximation that involves a truncation of the Dirichlet process to a finite number of atoms, . The resulting model therefore reduces to a finite mixture with components and a very particular prior on the weights of the mixture components. Note that the truncation level of has been set to a value Trunc, which is to be defined in the constants argument of the nimbleModel function. The following code sets up the model data and constants, initializes the parameters, defines the model object, and builds and runs the MCMC algorithm for the mixture of Gamma distributions. When a stick-breaking representation is used, a blocked Gibbs sampler is assigned (Ishwaran, 2001; Ishwaran and James, 2002). Using the stick-breaking approximation automatically provides an approximation, , of the random distribution . The following code computes posterior samples of using posterior samples from the samples object, and from them, a density estimate for the data. As expected, this estimate looks identical to the one we obtained through the CRP representation of the process. Blackwell, D. and MacQueen, J. 1973. Ferguson distributions via Polya urn schemes. The Annals of Statistics 1:353-355. Ferguson, T.S. 1974. 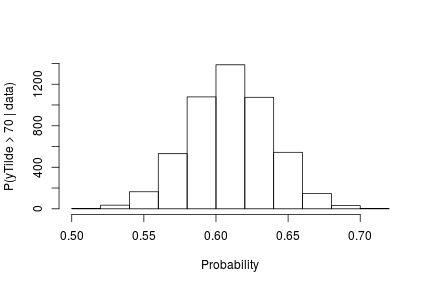 Prior distribution on the spaces of probability measures. Annals of Statistics 2:615-629. Lo, A.Y. 1984. On a class of Bayesian nonparametric estimates I: Density estimates. The Annals of Statistics 12:351-357. Escobar, M.D. 1994. Estimating normal means with a Dirichlet process prior. Journal of the American Statistical Association 89:268-277. Escobar, M.D. and West, M. 1995. Bayesian density estimation and inference using mixtures. Journal of the American Statistical Association 90:577-588. Ishwaran, H. and James, L.F. 2001. Gibbs sampling methods for stick-breaking priors. Journal of the American Statistical Association 96: 161-173. Ishwaran, H. and James, L.F. 2002. Approximate Dirichlet process computing in finite normal mixtures: smoothing and prior information. Journal of Computational and Graphical Statistics 11:508-532. Neal, R. 2000. Markov chain sampling methods for Dirichlet process mixture models. Journal of Computational and Graphical Statistics 9:249-265. Sethuraman, J. 1994. A constructive definition of Dirichlet prior. Statistica Sinica 2: 639-650. We’ve released the newest version of NIMBLE on CRAN and on our website. Version 0.6-12 is primarily a maintenance release with various bug fixes. avoiding assigning a sampler to non-conjugacy inverse-Wishart nodes (thereby matching our handling of Wishart nodes). We’ve released the newest version of NIMBLE on CRAN and on our website. Version 0.6-11 has important new features, notably support for Bayesian nonparametric mixture modeling, and more are on the way in the next few months. invalid dynamic indexes now result in a warning and NaN values but do not cause execution to error out, allowing MCMC sampling to continue. We’ll be giving a two day workshop at the 43rd Annual Summer Institute of Applied Statistics at Brigham Young University (BYU) in Utah, June 19-20, 2018. Abstract is below, and registration and logistics information can be found here. This workshop provides a hands-on introduction to using, programming, and sharing Bayesian and hierarchical modeling algorithms using NIMBLE (r-nimble.org). In addition to learning the NIMBLE system, users will develop hands-on experience with various computational methods. NIMBLE is an R-based system that allows one to fit models specified using BUGS/JAGS syntax but with much more flexibility in defining the statistical model and the algorithm to be used on the model. Users operate from within R, but NIMBLE generates C++ code for models and algorithms for fast computation. I will open with an overview of creating a hierarchical model and fitting the model using a basic MCMC, similarly to how one can use WinBUGS, JAGS, and Stan. I will then discuss how NIMBLE allows the user to modify the MCMC – changing samplers and specifying blocking of parameters. Next I will show how to extend the BUGS syntax with user-defined distributions and functions that provide flexibility in specifying a statistical model of interest. With this background we can then explore the NIMBLE programming system, which allows one to write new algorithms not already provided by NIMBLE, including new MCMC samplers, using a subset of the R language. I will then provide examples of non-MCMC algorithms that have been programmed in NIMBLE and how algorithms can be combined together, using the example of a particle filter embedded within an MCMC. We will see new functionality in NIMBLE that allows one to fit Bayesian nonparametric models and spatial models. I will close with a discussion of how NIMBLE enables sharing of new methods and reproducibility of research. The workshop will include a number of breakout periods for participants to use and program MCMC and other methods, either on example problems or problems provided by participants. In addition, participants will see NIMBLE’s flexibility in action in several real problems. We’ll be presenting a webinar on NIMBLE, hosted by the Eastern North America Region of the International Biometric Society. Details are as follows. This webinar will introduce attendees to the NIMBLE system for programming with hierarchical models in R. NIMBLE (r-nimble.org) is a system for flexible programming and dissemination of algorithms that builds on the BUGS language for declaring hierarchical models. NIMBLE provides analysts with a flexible system for using MCMC, sequential Monte Carlo and other techniques on user-specified models. It provides developers and methodologists with the ability to write algorithms in an R-like syntax that can be easily disseminated to users. C++ versions of models and algorithms are created for speed, but these are manipulated from R without any need for analysts or algorithm developers to program in C++. While analysts can use NIMBLE as a drop-in replacement for WinBUGS or JAGS, NIMBLE provides greatly enhanced functionality in a number of ways. The webinar will first show how to specify a hierarchical statistical model using BUGS syntax (including user-defined function and distributions) and fit that model using MCMC (including user customization for better performance). We will demonstrate the use of NIMBLE for biostatistical methods such as semiparametric random effects models and clustering models. We will close with a discussion of how to use the system to write algorithms for use with hierarchical models, including building and disseminating your own methods. We’ve released the newest version of NIMBLE on CRAN and on our website. Version 0.6-9 is primarily a maintenance release with various bug fixes and fixes for CRAN packaging issues. and a variety of bug fixes.